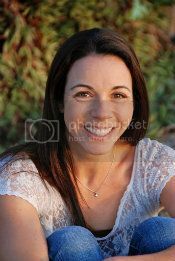 I'm very excited to have Jessi Kirby here today as a feature for Best I've Read 2012. In Honor was one of those books that can't adequately be described - it must be experienced. Please take a few minutes to learn more about this amazing author! How would you describe IN HONOR in three words? IN HONOR is a very emotional book for many reasons. What was the hardest part about writing it? Definitely balancing the heavier, emotional scenes with the fun and romance of the road trip. I wanted to be sure to respect Honor's grief over her brother while allowing her to begin to heal and move on at the same time. During the road trip, Honor goes scuba diving in the middle of the desert, and the images from the scene were some of the most beautiful that I've read. Have you been scuba diving in the desert? Or did the scene just come to you? Wow, thank you so much! I appreciate that, because that scene took me a loooong time to get just right. I do scuba dive, but I've never been diving in a cenote like that. I actually saw a picture of that one, The Blue Hole, in one of my husband's dive magazines, couldn't believe it was in the middle of the New Mexico desert, and decided I had to somehow work it into Honor and Rusty's trip! If you were going to take a road trip, what would be your destination and why? Ooh, there are so many choices! I think my destination would be New York City, because I've never been and I'm dying to visit it. Also because driving from this coast to that one would make for one heck of a trip. Think of everything in between! By anyone, ever? Can I pick two? They are totally tied--thematically, and as favorites in my mind. What can you tell us about GOLDEN? Golden is two parts swoony love story, one part mystery. It's the story of Parker Frost, who finds the journal of a girl who has become a legend in her small town. Julianna Farnetti disappeared ten years earlier, along with her boyfriend, and the entire town mourned the loss of this "golden couple." When Parker reads the words of this girl who was her polar opposite and finds that they may not have been so golden after all, it sets her off on a journey, (along with her best friend and the boy she's had a crush on for years), to find out what she truly believes in. It comes out in May of next year, and I couldn't be more excited. It's a story that's near and dear to me, one that pushed me as a writer, so I hope people enjoy it! 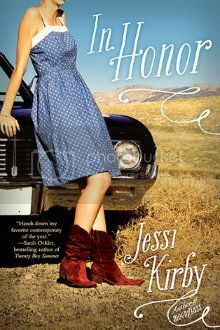 I am very excited to have one copy of IN HONOR to give away! Honor is one of my favorite names. Another emotional book I read this year was Unbroken (although I don't think it was published this year). I really loved Wanderlove by Kirsten Hubbard! I'd have to go with The Secret of Ella and Mischa, Easy and Pushing the Limits. Maybe I'd add Slammed and Point of Retreat to that list too! Thanks for the great giveaway! For me, The Fault in Our Stars, The Sea of Tranquility and Pushing the Limits topped this year's emotional books. I'm going to say In Honor. It was one of the first books I read this summer and although I didn't lose a brother in Iraq, I lost a good friend and the story helped me heal in so many ways. Thanks for the giveaway. I've been meaning to read this one for quite some time now. My favorite emotional book that I have read this year is an Indie book called "The New Haven Project: Anomaly"
from author Jessica Marie Gilliland. This book is so amazing!! I highly recommend this book to everyone! This story had me crying!! Must read! !